The morning came too early with a knock on our door at 6am. 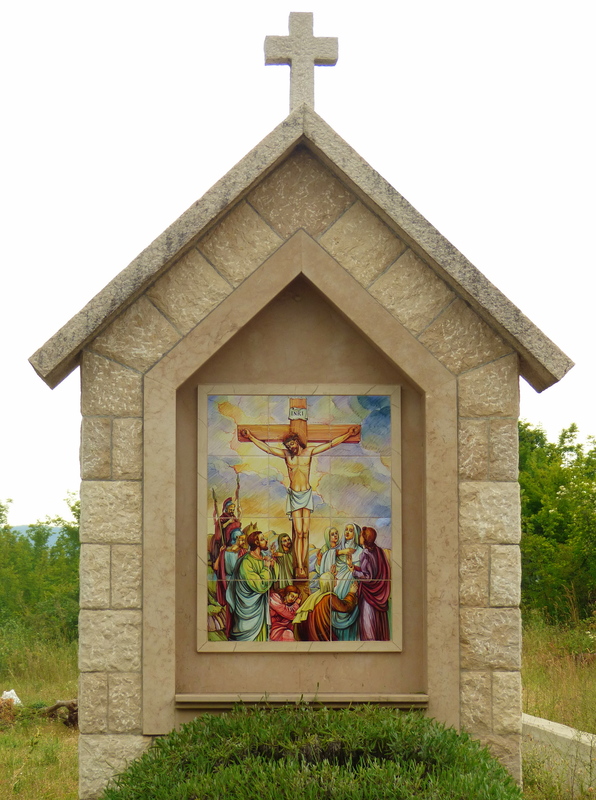 The family wanted to go to their beach apartment in Croatia and we had already agreed on an early wake up. We had coffee and cake with Ivan, his parents and grandfather before it was time to hit the road. We took a few pictures, then hopped on the bike feeling inspired. We talked about the generosity of the family and hopefully extending that same generosity to others in the future. We reached the border crossing after a few miles and were sad to be leaving Bosnia and Herzegovina after only a few days. 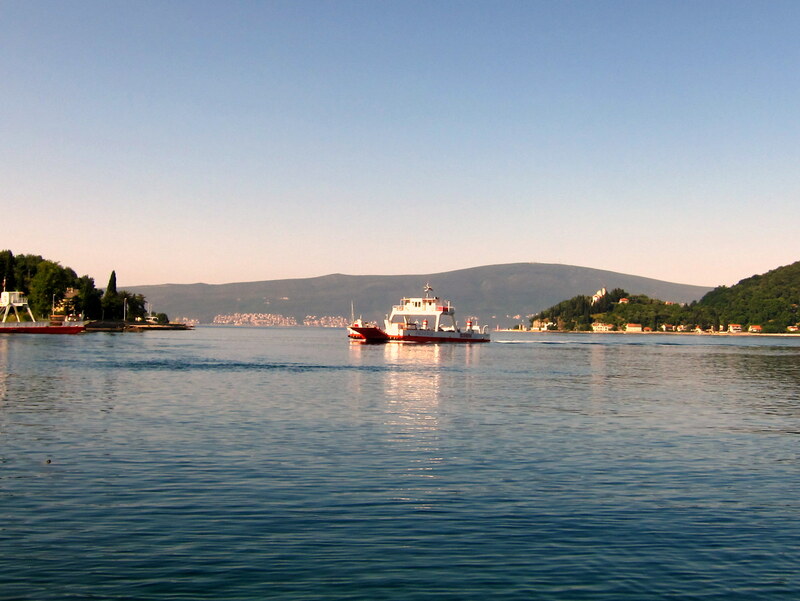 However, not wanting to turn around, we continued on into Croatia. We didn’t notice much of a change in the first 20 miles because everything was written in the same language and had the same general feeling. Right before the town of Imotski, a car started honking at us, which we thought was just an aggressive Croatian driver giving us a “welcome”. However, it was just Ivan and his parents honking and waving, with the windows rolled down, taking pictures of us riding. It was great to see them one more time before turning into town. It was also a perfect time for a break. Having only eaten cake with our coffee, we were both feeling crashed after so much sugar and caffeine. It was time for a proper snack and some bike maintenance. My front wheel was clicking so loudly that Chandler could even hear it, several feet away from me. While I made us sandwiches, he quickly changed the bearings of my front wheel, same process he had done to his front wheel in China, and again in Istanbul. We haven’t really ridden much in mud or dust or immersed the bearings, so it just seems that their seals are not that great. 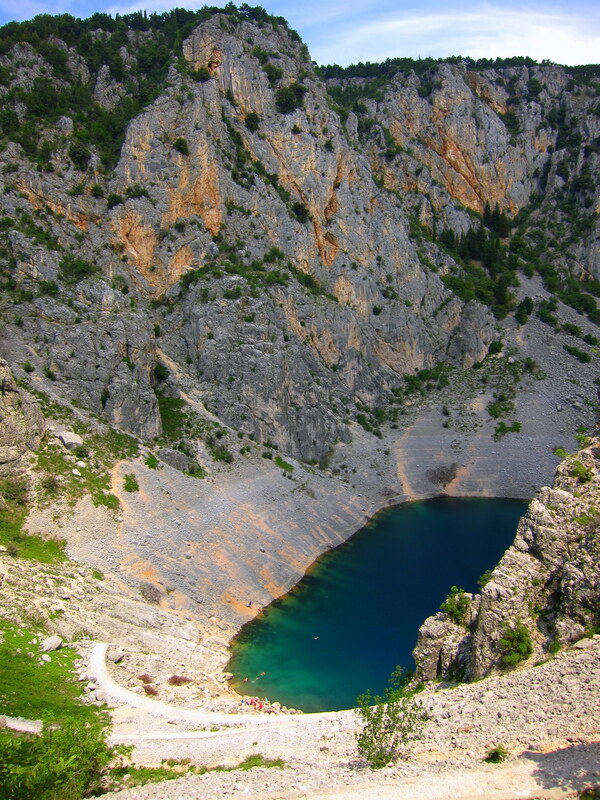 Back on the bikes, we cycled into Imotski, Croatia and headed straight to the Blue Lake. This lake is one of two famous sinkhole lakes in the area and this one was obviously a beautiful color blue. The lakes are really deep and connected to an unexplored subaqueous cave system, which is kind of spooky. We enjoyed some free internet at a nearby café before venturing down to the water. While I did go into the water, I did not stay in long enough for Chandler to take my picture. 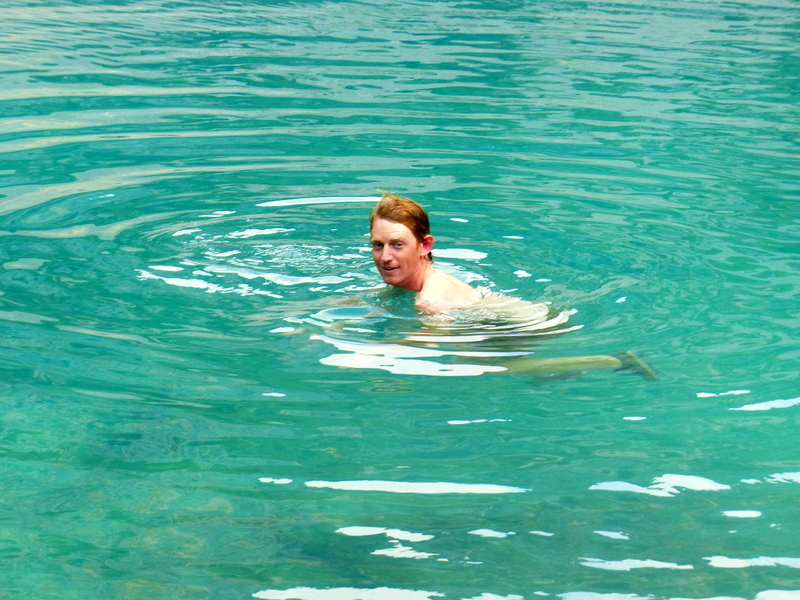 I grew up swimming in the safety of swimming pools, while Chandler spent more time in lakes, rivers and the ocean. I tend to not stay long in places I find creepy, dark, dirty, murky or have any number of other “conditions”. Chandler only swam for a few minutes before it was too cold and came out to start the climb back to the bikes. At this point, the clouds had come out and it was starting to sprinkle. 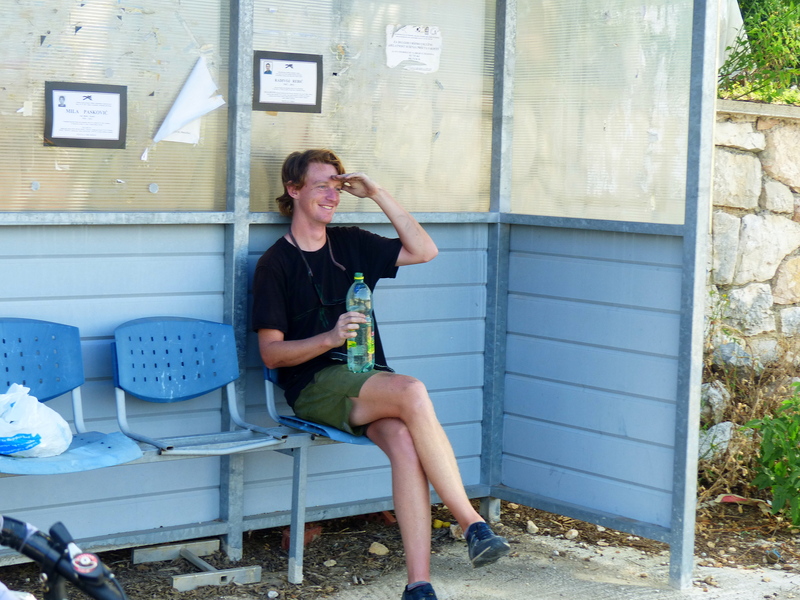 Chandler agreed that we could stay in town if we found a place for 20€ or less, but there were very few options. We stopped at a bakery for our favorite cheese pies and asked about rooms for rent, but the baker knew of none. After a few inquires at hotels, the cheapest rate was around 60€. It was obvious we were now in expensive Europe and we’d be putting in more miles today. Back on the road, we headed out of town. The map on the GPS was not of the best quality, so we stopped at a mega mall to look for a map. I waited outside with the bikes while Chandler went shopping. Coming back empty handed, we had no option but to continue in the basic cardinal direction we knew we needed to go. Outside of town, we were immediately in the countryside. We skirted along a mountain ridge, we knew we would eventually have to go over, but we were avoiding as long as possible. 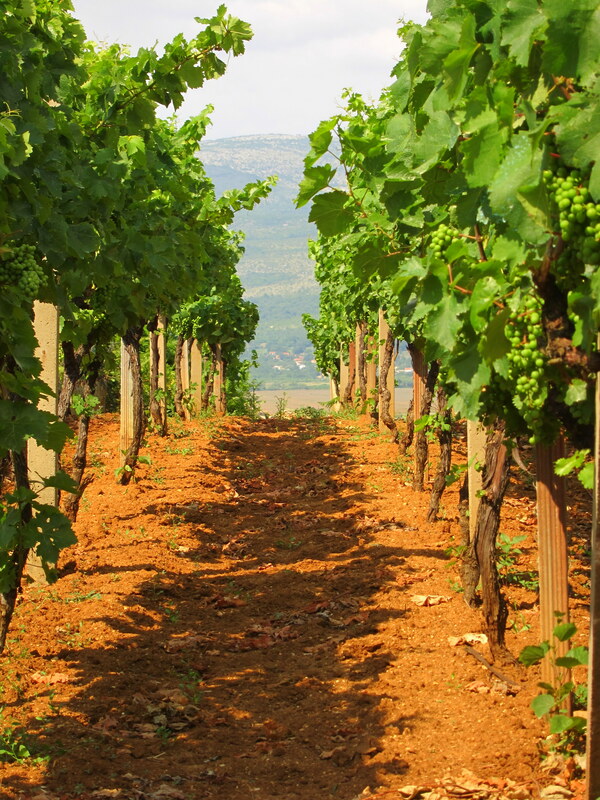 We passed through a number of vineyards, where I was disappointed to not see anyone selling their products. Eventually we found ourselves sitting on the road, trying to figure out what to do. I wanted to camp in the nearby pasture, but Chandler was not convinced that was the safest place. 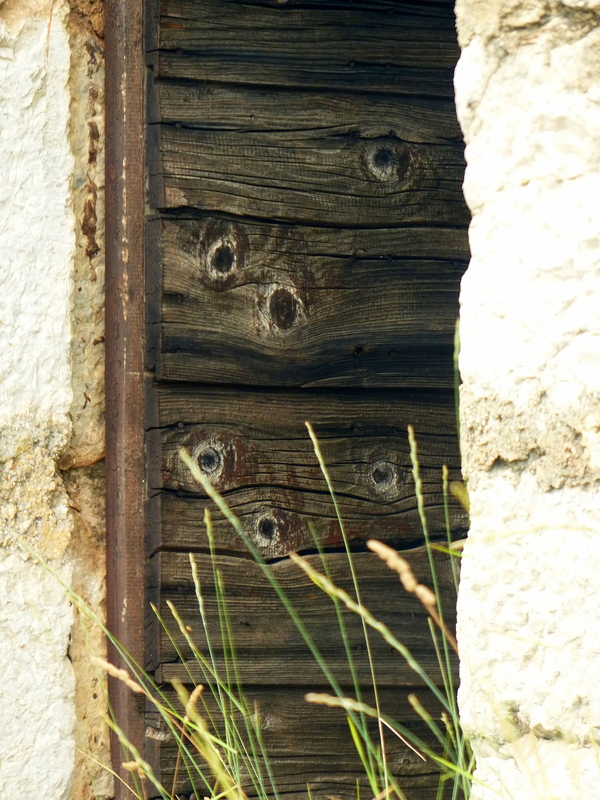 I walked up the road and found room leading behind an abandoned stone hut. Chandler thought it was a better place, I thought it was creepy and might be haunted, but agreed to camp there. We promptly set up camp outside the hut and proceeded to relax, Chandler took a nap and I read my Kindle. We could see across the valley from our vantage point and noticed a number of other stone huts scattered around the hillsides. We figured they probably belonged to old sheep or goat herders who either moved into the towns or died off. We had a moment of concern after dark when a car stopped on the road above our spot, not 50 feet away, and I was sure we were going to be harassed. Luckily, after a few minutes idling, the person moved on and the worse we had to deal with was a short burst of rain. 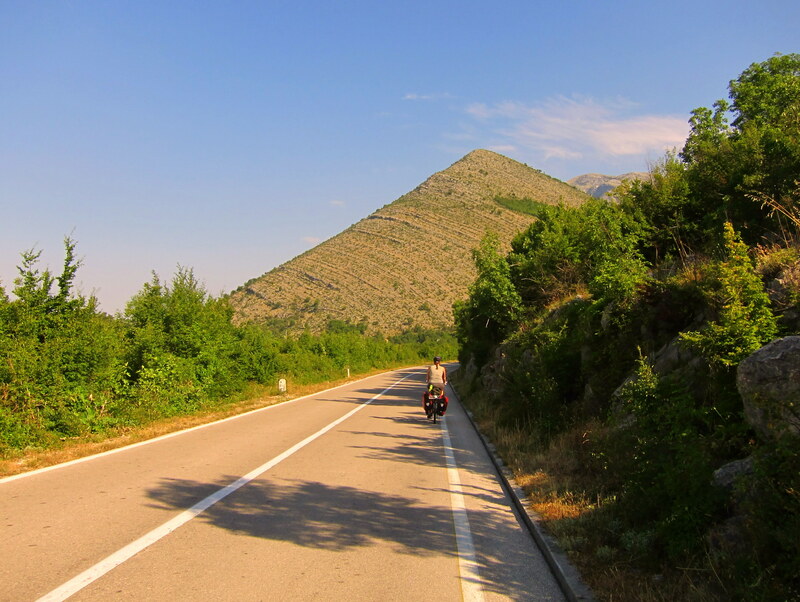 Maybe the ride into Mostar was bad because we were expecting a headwind, no shoulder and lots of traffic. That is exactly what we got. So, we just put our heads down and pedaled as fast as we could. 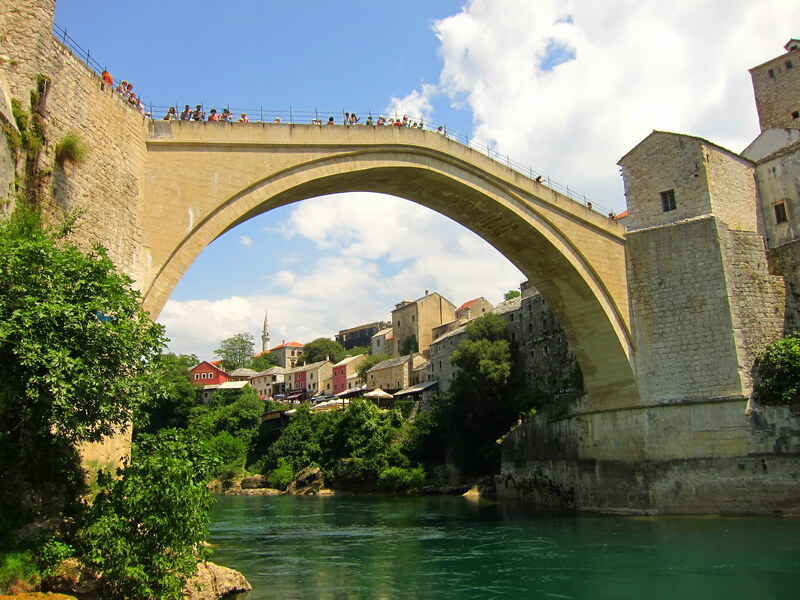 Once in town, we headed straight to the famous Stari Most (“Old Bridge”) and took turns waiting with the bikes while the other went to take a look. The bridge is actually very new as the original one was heavily damaged in 1993 by Bosnian Croat bombs. There is the usual tourist area around the new bridge with people selling the usual cheap crap, but also relics from the Bosnian War, including decorated bullet shells. While the tourist areas are our least favorite places to be, we were not especially eager to get back on the road. Instead, we took a long lunch over pizza and several cups of coffee. Knowing that lodging was expensive, we had to keep moving. We wound up the less busy road out of town which turned out to be pretty nice. There was still a lot of traffic, but the trucks were all routed a different way so that gave us some relief. We are always seeking the road less traveled, even if it adds more miles, so when given the opportunity we turned off the highway. As usual, the road started out wonderfully. We passed through a neighborhood and a wedding, with a large group of drunken men serenading the bride. The scenery was beautiful and we were having a lovely time, and then at the bottom of a huge hill the road turned the dirt. We were on another Chandler “shortcut” or “adventure route”, as he now calls them. This one wasn’t too bad after the first mile of gravel gave way to smooth, hard dirt. 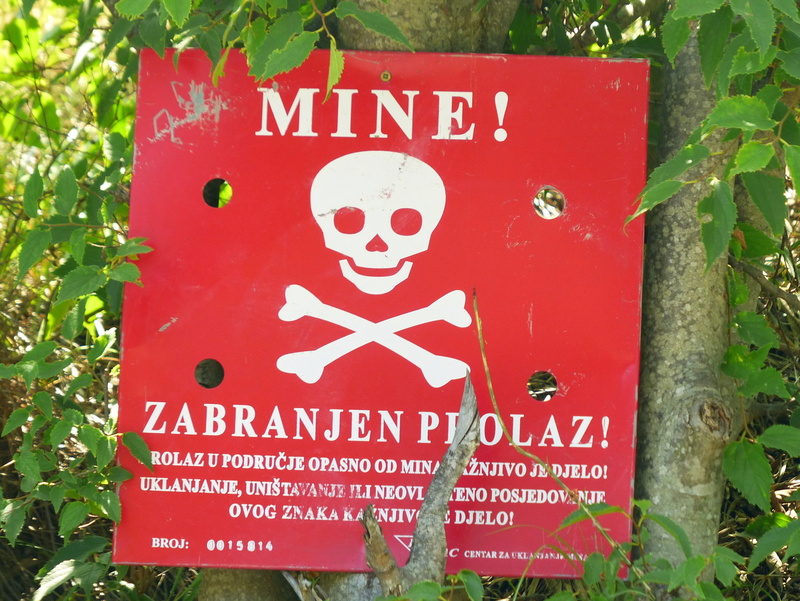 There were a number of ideal free campsites, but the fear of landmines and the desire for a shower, kept us moving. We were looking for a place to camp that looked like people used it, so we didn’t have to worry about mines, but also not too used so that people wouldn’t find us and kick us out. A few sheep pastures looked OK, but nothing stood out. The road led us through a small village. Chandler stopped to take a picture of a pretty church while I continued on slowly. When I didn’t hear him coming after a few minutes, I waited near house. As Chandler approached me, a young man hanging around the house asked if I needed any help or could he fill our water bottles. Never one to give up the chance for free water, we took his offer. Ivan, two sisters and mother immediately made us offers of juice, coke, coffee and beer. One thing led to another and we found ourselves being lead next door, to his grandfather’s house, for a glass of homemade grape whiskey, rakia. We asked about camping in the area, finding out there was none, he called the hotel we were headed for to make us a reservation. It turned out, there was a wedding at the hotel that night and no extra rooms. The next hotel was at least 20km away and with the sun setting, we had no idea what we were going to do. Ivan and his dad exchanged a few words before announcing that we would be spending the night in their extra bedroom! We were then ushered in the house, dropping our bags off in the spare room, and told that dinner would be a few more minutes. 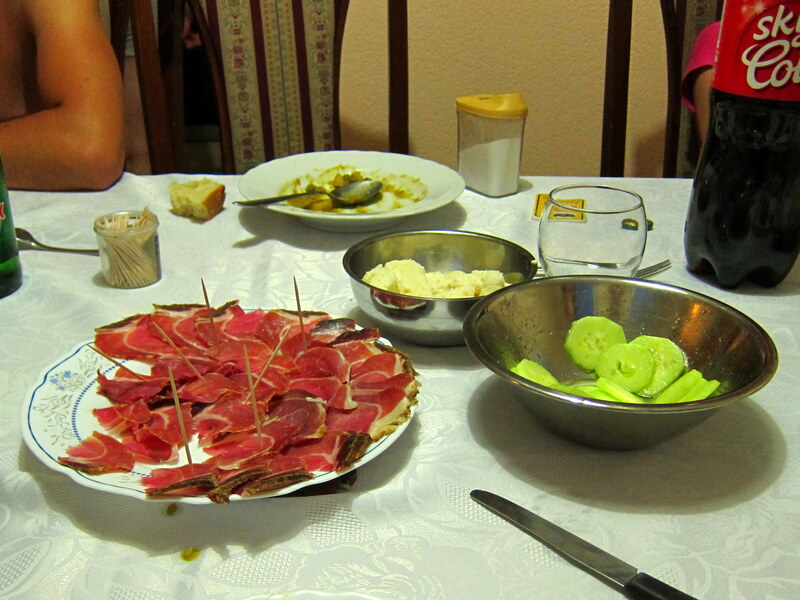 Dinner turned out to be an amazing feast of fresh cheese, beef soup, cucumbers, grilled green peppers for me, prosciutto and bread. Everything was from the garden in their backyard or from a family member’s farm. The grandfather joined us for dinner and contributed homemade wine. After dinner, Martina, Ivan’s younger sister, gave my hair a little trim (she is going to school to be a hairdresser) and Chandler hung out with the men getting a tour of the backyard orchards. They were very curious about our trip and assumed that we normally found a family to take us in for the night. After my haircut, we all ended chatting outside and eating watermelon. At 1am, when everyone was clearly tired it was time to go to bed. We could not believe our luck with finding Ivan and his family. We had both read about other bike tourists having similar experiences, but never thought it would happen to us. It is incredibly inspiring to meet such genuinely nice and generous people, who ask for nothing in return. It really made us think about how we want to live and treat other people, especially strangers, when we return to the US. As per our agreement, we woke up bright and early at 6am. While we wanted to get on the road quickly, we didn’t rush breakfast and used the fast internet connection one last time. At 730am, we were loading up the bikes when the owners came out to say goodbye. The first 50km were flat and fast. We made excellent time and were delighted to find the traffic to be courteous. As an added bonus, I was feeling really strong and ended up being in the lead. At the half way town, we stopped at a gas station for some cold drinks and ice cream. Our break lasted about an hour, then it was time to get back on the bikes. We were dragging a little as we knew there would be hills coming up. As challenging as climbing one mountain for several hours can be, rolling hills are worse. It is difficult to get into a rhythm because gears are constantly being changed and the downhills are too short to be restful. We also had the added bonus of no shoulder on the brand new but super narrow road. Traffic volume increased and though everyone was pretty courteous the road was way too small for everyone. 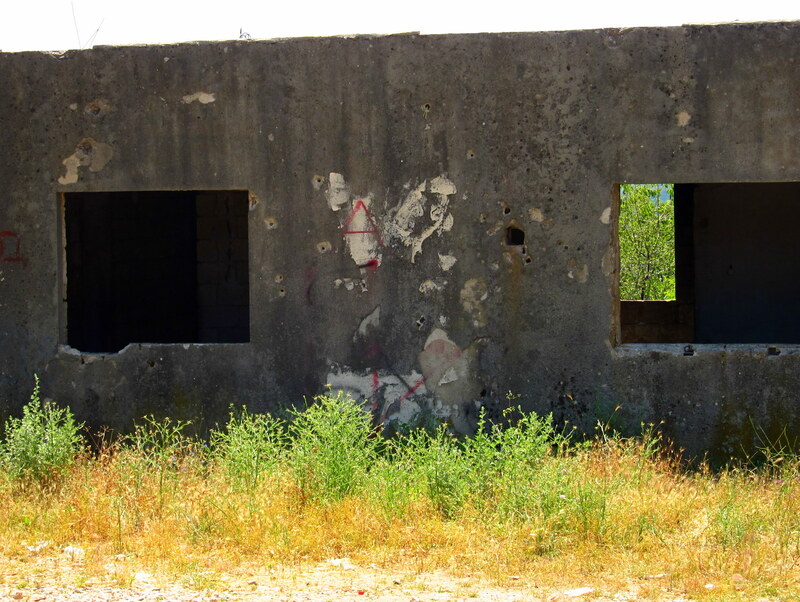 We started seeing buildings with bullet holes in the concrete and signs about landmines. We stopped a couple more times to catch our breath, have a snack and fruitlessly scour the map for an alternate route. 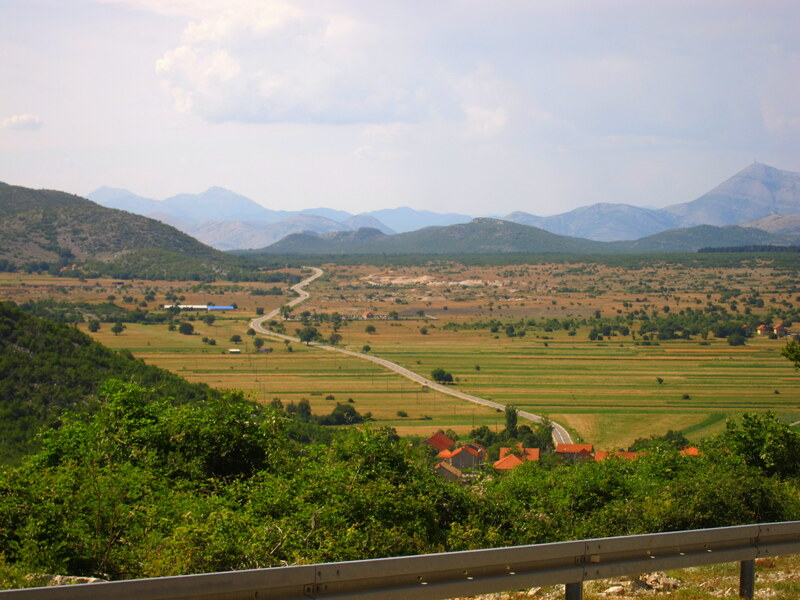 Eventually, we got through the hills and hoped it would be smooth sailing to Mostar. But no. As soon as we hit flat ground, we also hit a serious headwind and rush hour. Traffic became impossibly dense, now clogged with big rig trucks and tour buses. 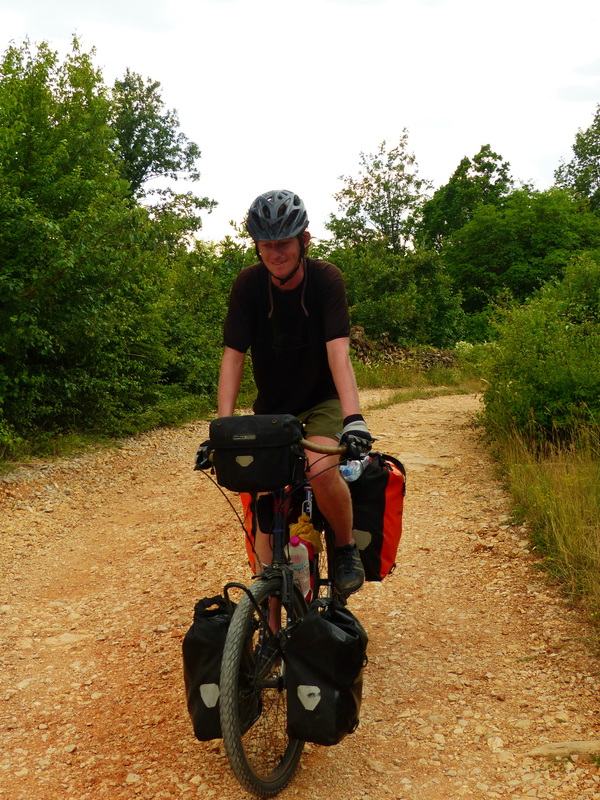 We saw a few other recreational cyclists out on the road which seemed insane, but confirmed to us that there wasn’t some other, nicer road to be on. A few miles outside of town, we threw in the towel and stopped at a hotel. It was a good thing too. We found out later that there were no hotels in Mostar under 30€. It had been a long day. The riding by Trebinje was great but we were wondering if we made a huge mistake in our route selection by coming to Mostar. Tomorrow we’d go see the famous bridge in town and try to make an escape from the traffic madness. Chandler spent the evening route planning on his new Open Street Map based GPS map and I Skyped with my friend Andrea in Nome. 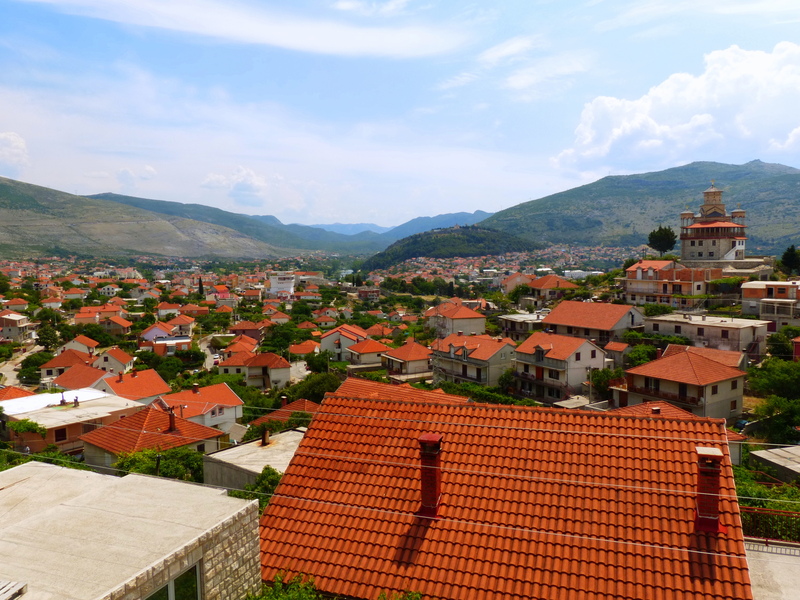 We woke up early with the intention of continuing on to Mostar, but we wanted to enjoy the town and our wonderful apartment. Because we just took a day off in Kotor, the deal we made was that we would have to ride the entire 100km to Mostar the next day. I had no problem agreeing to that because half of the ride should be flat! 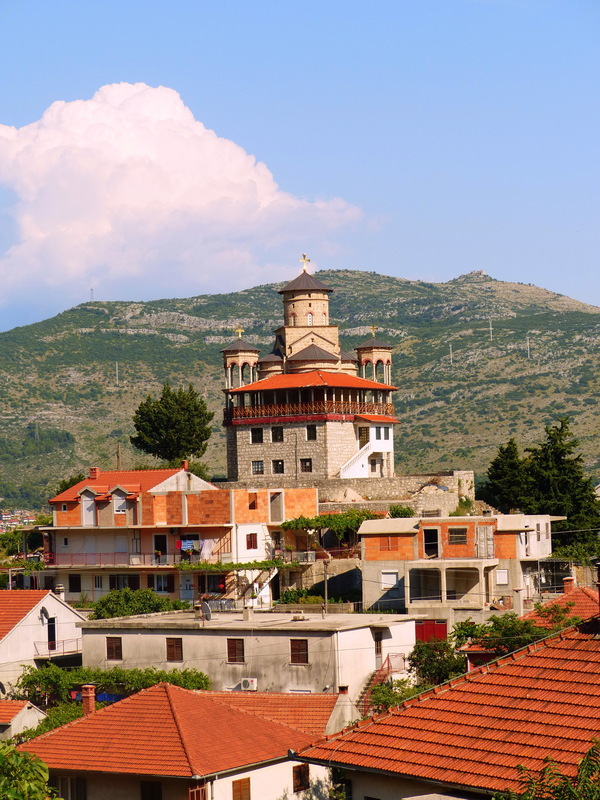 Trebinje turned out to be a really charming little place. 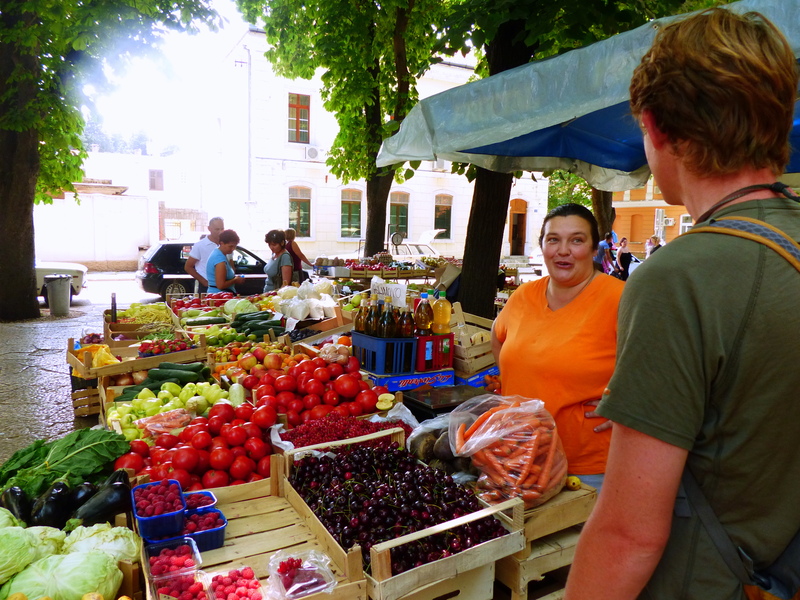 We spent a few hours enjoying coffees near a square which was also hosting a farmer’s market. 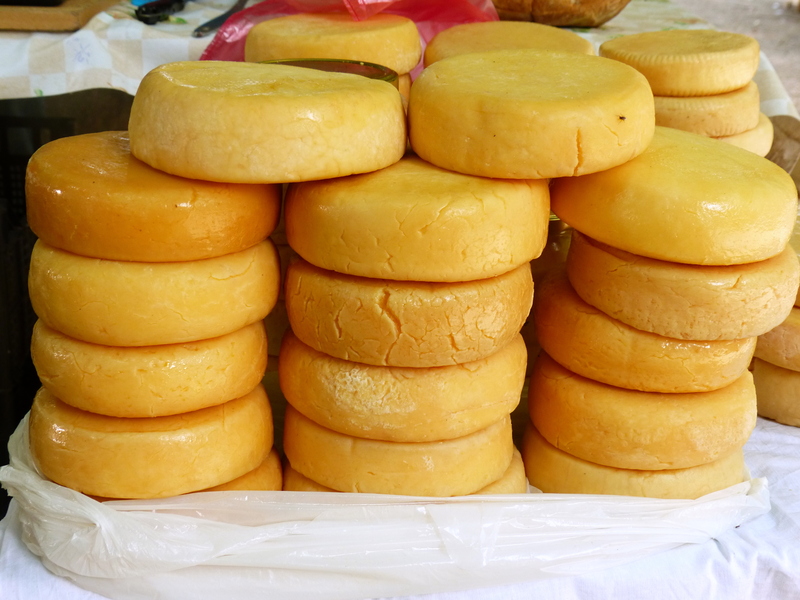 We were able to buy local veggies, cheese and wine at very reasonable prices. The woman who sold us the vegetables and fruit was incredibly generous and gave us large samples of a number of her products before we made any purchases. A good strategy on her part, because we ended up spending most of our money at her stand. 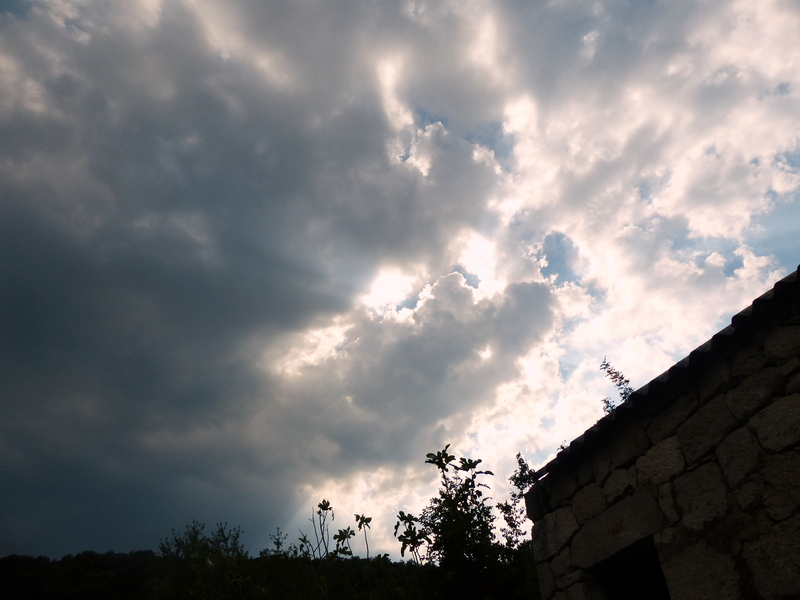 When the clouds came out and covered the sun, we walked around the town. 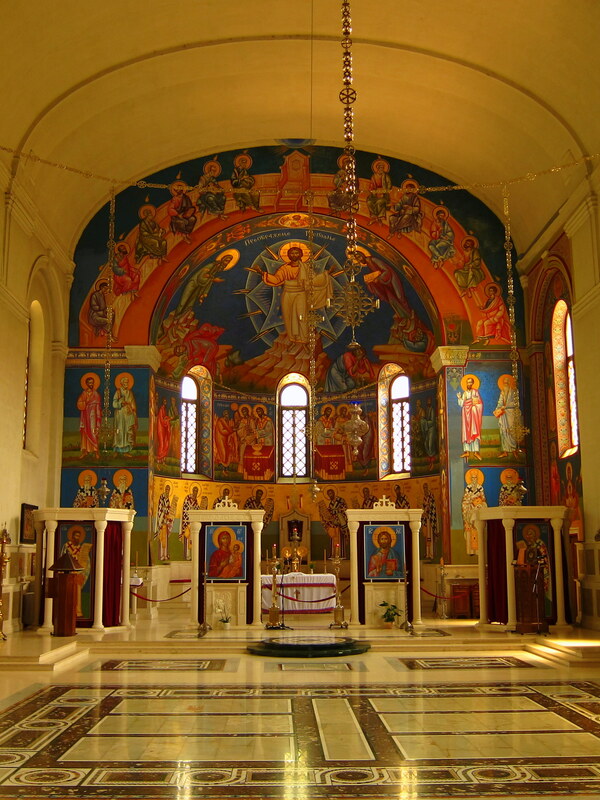 There were a number of beautiful churches open for viewing or praying. Chandler was especially excited about an old bridge. 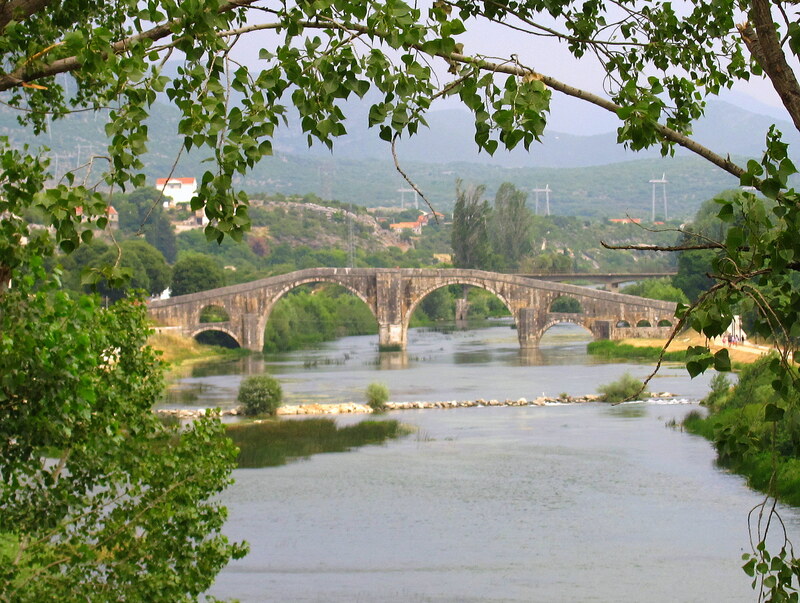 The Arslanagic bridge was originally built in the 16th century, but had to be moved due to a dam built in the 1960s. 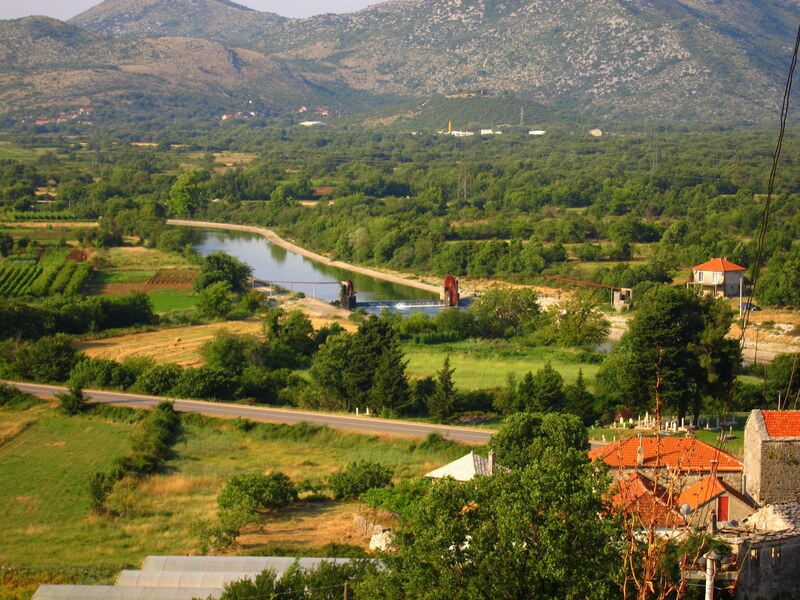 So, the bridge was taken apart and rebuilt in downtown Trebinje. We spent a leisurely evening cooking, Skyping with family and watching episodes of Mythbusters on the big TV. It was a really relaxing day. After our pleasant day exploring Kotor we had to hit the road again. Our original plan was to cross into Croatia and spend a day at Dubrovnik, which by all accounts is an awesome place. 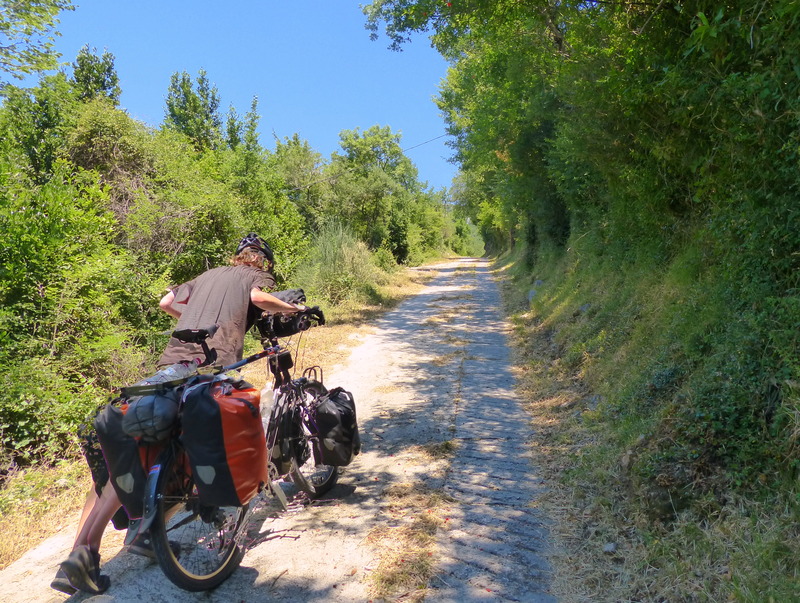 However, after a considerable amount of research we discovered that getting in and out of the city on a bike was a dangerous and stressful undertaking, as the highway was the only way in and out. We were also a little sick of sharing space with tourist hoards. Even though we’d only been in Kotor for one day, we were ready to get off the beaten path again. 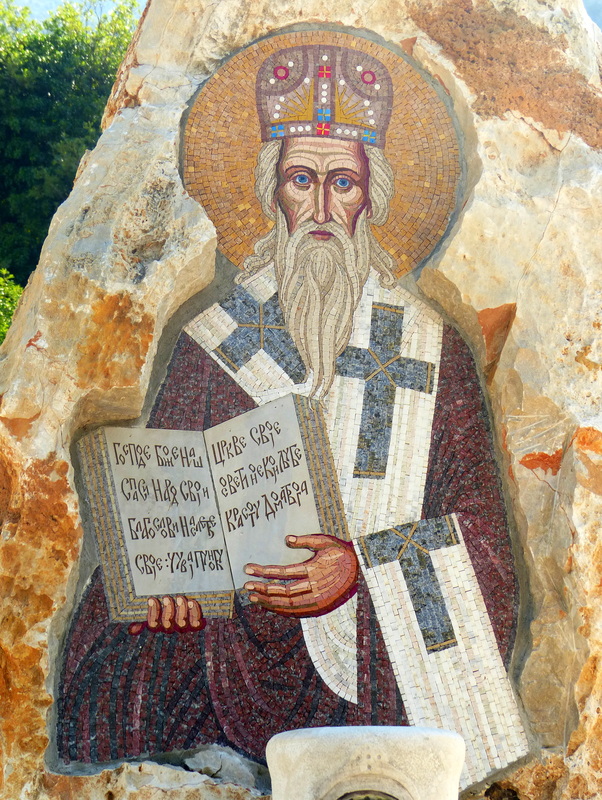 So our only other logical destination was Trebinje, Bosnia. We didn’t find a lot of info about the place online, but there was a cheap place to stay and the little we did find to read was positive. 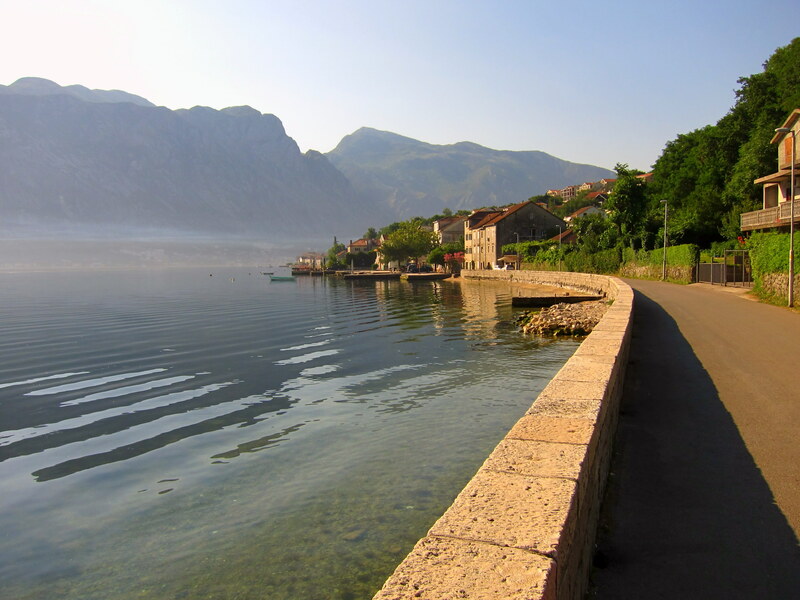 Kotor Bay has a main road which winds along the shore headed west , or an alternative route that runs on the opposite side of the bay which links up to the main road with a short ferry, cutting out a few miles. We usually wouldn’t “cheat” by taking the ferry to cut out distance, but the main road was busy and the far shore looked pretty quiet so it was an easy choice. Things went fine until we got off the 1€ ferry and were dumped on the main road. We tried to escape the traffic by following the local road along the coast, but instead of being jammed with cars it was loaded with sunburned tourists wandering all over the place. Chandler’s bell was almost constantly ringing as we swerved around the oblivious holiday-makers. Eventually, we got funneled the wrong way onto a one way street that ran at the bottom of a big hill. The highway was the only road that ran in our direction, at the top of the hill, so we blissfully rode against traffic which infuriated the other drivers. It was a small local road, so traffic was slow and there wasn’t any danger, but it did require oncoming traffic to give us some room and slow down a little. One man rolled down his window yelling something and pointing at us then screamed “police, police!!”. Sure enough we rounded the corner and there were two police officers standing watching traffic. Chandler gave one of them a nod, he nodded back and continued to watch traffic- they could not have cared less. This all may seem insignificant, but after the past few days of dealing with ridiculously inconsiderate drivers we reveled in our ability to return the favor in such a satisfying way. 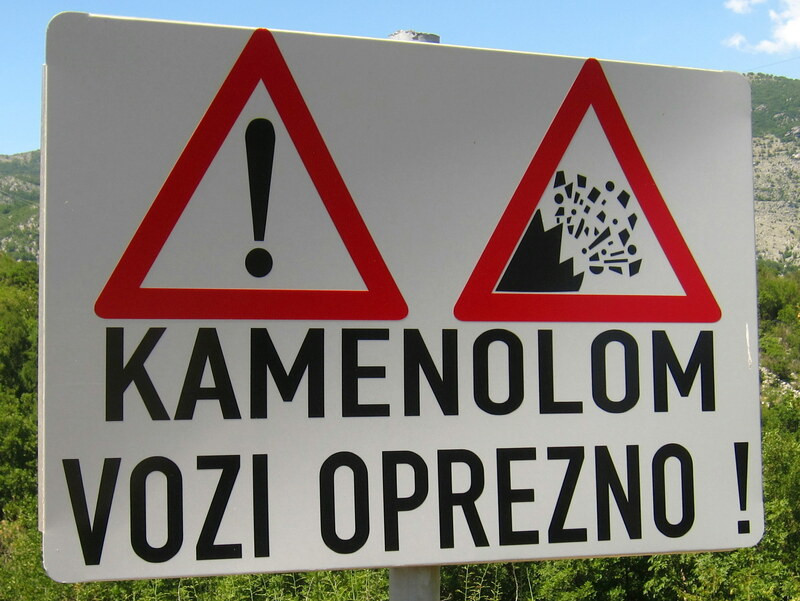 Our moods buoyed by our immature act of traffic safety rebellion, we turned north towards Bosnia and started to climb. And climb. And climb. We ended up on another of Chandler’s shortcuts which started out as a paved road, which deteriorated into a pair of concrete strips in the grass at what we estimated to be about 15% grade and then to completely washed out gravel at the same grade. We did a lot of walking. It was so ridiculous it didn’t really spoil our moods much. When we got the top we had a snack of chocolate cookies and then finally met up with the main highway. It was a brand new road with perfect asphalt that continued to climb, but at a manageable grade. It was really hot though and we didn’t have much water. The climbing was relentless and our moods started to tailspin. Right as I was feeling really low, I came around a corner and spotted Chandler talking to three other bike tourists. They were a group of two guys and a girl in their early 20’s from Montreal riding from Spain to Greece for a music festival. 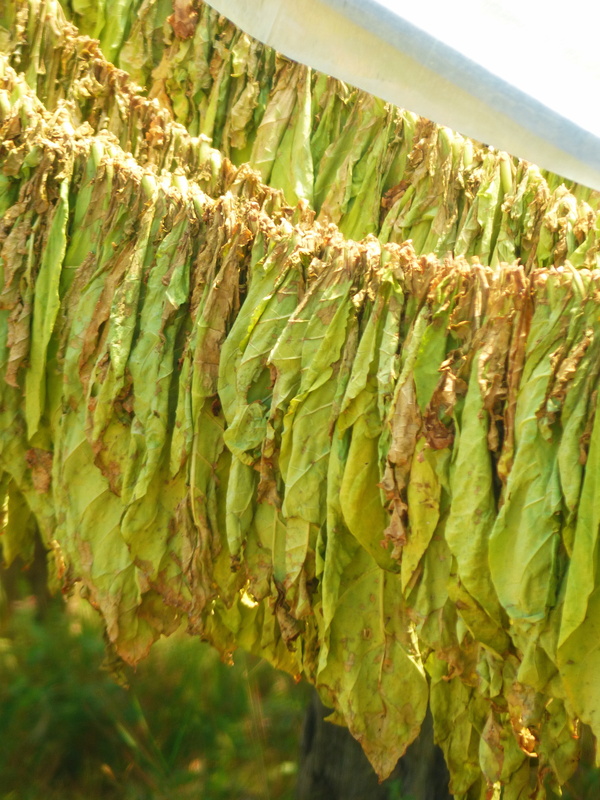 We traded travel stories for a while and had a nice chat. 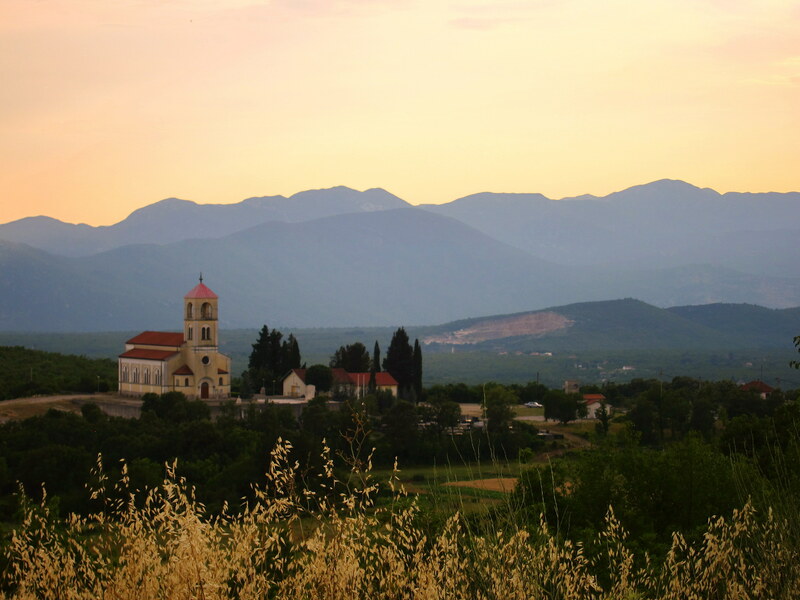 They really enjoyed Bosnia and we told them about our favorite places in Albania. They let us know we were almost to the top of the hill and the rest of the ride to Trebinje should be pretty easy. We parted ways and felt emotionally reset. After a quick 20 minutes of climbing we hit the Montenegrin border and were stamped out into no man’s land. It was a little confusing because we rode along for several miles thinking we should have been stamped into Bosnia by now, and just when we thought maybe the border we crossed was some sort of a combo thing we rounded the corner and saw the Bosnian border station. Again, no problem getting our stamp, and we rolled down a huge hill into an extremely flat valley. 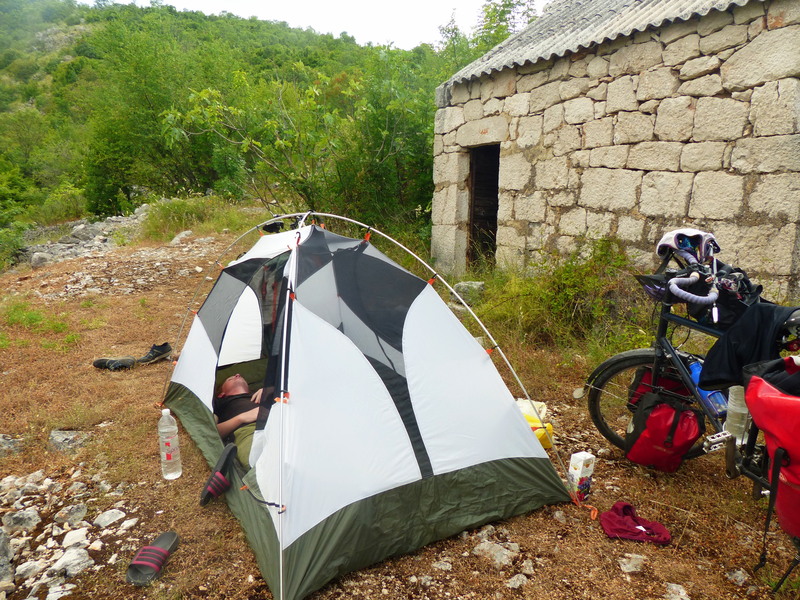 We breezed into Trebinje, but we feeling pretty shot after all the climbing. At the outskirts of town I spotted a motel, so we swung in to check out the prices but were turned away, which was weird since the place looked empty. Chandler remembered that he saw on the internet a place way up on the hill on the other side of town for 25 Euros so we rode over there. When we got to where he thought the place should be there was no sign of it. Our moods were starting to sink again. Chandler turned around and was waiting for me to catch up before turning to ride downhill back to town. 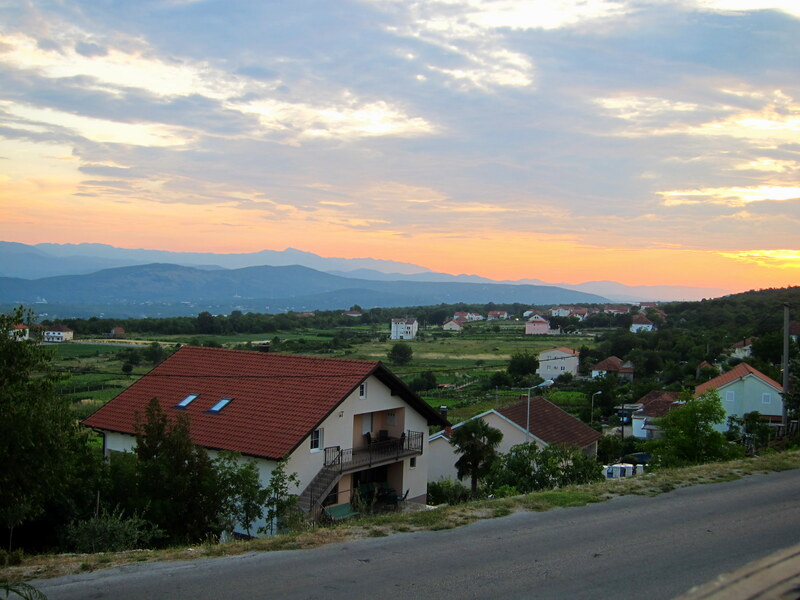 I was taking my time when a woman came out of a house and started speaking to me in Bosnian. I was able to communicate that we needed a place to sleep and she indicated I should wait for a minute. Out came her husband who spoke pretty good English and I secured us a room at their house for 20 Euros! There were three apartments in the building and since no one else was staying there we got our own floor which had three bedrooms, a bathroom, a full kitchen and living room with a huge TV. The owner pulled out a bottle of prune whiskey made by his son in-law and we enjoyed a drink with him before taking showers. The apartment had a balcony that looked out over the whole valley and the town below. We cooked up a nice dinner of vegetables and relaxed by watching some stupid American television. What a day!